Debunking Christianity: How Come That’s in the Bible? Where Do You Draw the Line? How Come That’s in the Bible? Where Do You Draw the Line? When piety gurus come up with an idea and it takes tenacious hold in minds of the faithful—no matter how bad it is—it can endure for centuries. Relics are first class gimmicks; bad theology, but they’re good for business. I’m told that relics fall into three categories: body parts of a saint, something he or she owned—or even an item that has been touched by the saint. I suspect latent atheism lurks behind the fasciation with relics: Since God cannot be seen, a relic is something tangible. The adoration/veneration of relics gives the faithful something to look at—a fragment of God right there in front of them…so he must be real. Protestants have their own version of a relic, and it too is highly prized as evidence of God’s presence in the world, right there on paper: for Protestants the ultimate relic is the Bible. It has pride of place on altars, TV preachers wave it around, it’s a talisman for swearing oaths. The concept of canon—a body of works deemed holy, the very word of God—is magical thinking, i.e., a thing provides a way to know God, with no evidence whatever to support the claim. In fact, there is a lot of evidence against it, especially its inferior quality. Even most laypeople, given the chance—and if they can bear the tedium—could pick out a thousand Bible verses to get rid of. It contains so much fluff and dross. Why would God take the time to inspire these verses? Well, I guess he’s got all the time in the world, so to speak. So how does he figure that these verses help us understand him? But never mind, they’re in the Bible, they are fragments of epic stories, and we can be sure that countless commentaries, books, articles, and doctoral dissertations have analyzed these texts ad nauseam. There are at least a thousand other such throw-away verses. Which brings us to take a look at the last chapter of the apostle Paul’s Letter to the Romans, the final stop on my tour of the epistle during 2017, here on the DC Blog. Paul wraps up his letter with greetings, in one form or another, to more than twenty people. This has prompted speculation that chapter 16 wasn’t originally part of this letter to the Roman congregation, since he had never been there. How could he know so many people? Some scholars have speculated that chapter 16 may have once belonged to a letter that he wrote to the Ephesians. But there was so much travel—all roads led to Rome, after all—that it would be no surprise if a lot of Paul’s colleagues and friends had ended up there. But, back to my point about too much clutter in the Bible. How does this chapter quality as ‘word of God’? Why is it worth reading, and why have scholars wasted so much time and energy trying to figure out if it’s ‘authentic’? Who cares? That’s precisely the problem with the concept of “canon”—if it’s in the canon, devout scholars labor over every word to squeeze out every last drop of divine wisdom. In fact, this chapter helps demonstrate Paul’s obsessive-compulsive piety. He had fallen down the rabbit hole of Christ fanaticism, hence in verses 1-16—in which he mentions so many people—these words pile up: “welcome her in the Lord,” “who works with me in Christ Jesus,” “the first convert in Asia for Christ,” “they were in Christ before I was,” “my beloved in the Lord,” “who is approved in Christ,” “greet those in the Lord,” “greet those workers in the Lord,” “who worked hard in the Lord,” “chosen in the Lord,” “greet one another with a holy kiss.” All this babble about Christ may be endearing for those in the cult, but the rest of us are not impressed. 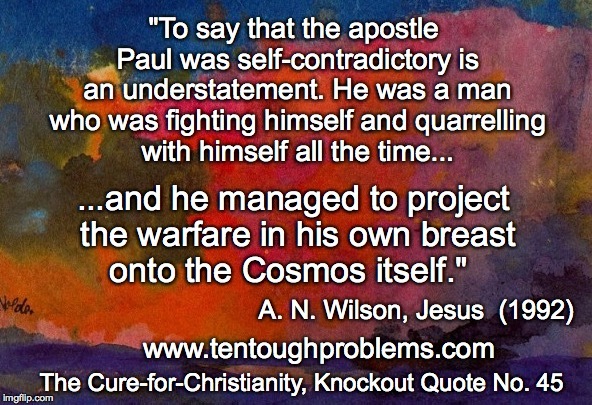 Paul had already deceived the simple-minded! And in the next verse, 16:20, he assures his readers that Christ’s arrival can be expected soon: “The God of peace will shortly crush Satan under your feet. The grace of our Lord Jesus Christ be with you.” Yet another ‘word of God’ that proved to be wrong. How does Paul survive as a Christian hero after getting so much wrong? People seemed to have trusted Paul because he had his visions in which he talked to Christ. It sounded so reassuring that he knew the “revelation of the mystery that was kept secret for long ages.” He topped it all off with the magic formula for achieving eternal life (Romans 10:9). Who wouldn’t want to join that cult? I have reached a certain age; I know that I could expire before my credit cards do—and yet, I’m off on another major project: writing a full commentary on Romans, with the working title: Bad Bible Theology: An Atheist Refutation of the Apostle Paul’s Letter to the Romans. 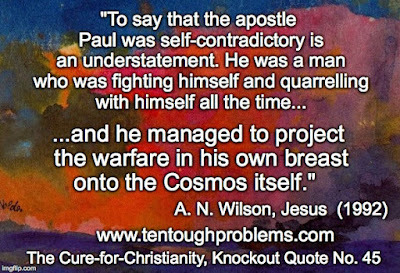 What needs to be revealed is that the apostle Paul was a fraud. He was not the custodian of ancient secrets, and the Christ he preached so passionately never showed up. So I will write an irreverent commentary on Romans—erudite I hope, to be sure—but highly readable as well, and laced with humor. If we can’t laugh our way through this dense patch of bad theology, what’s the point?